We had our first snowfall of the season in Northern Virginia last week, a cause for celebration since we hadn’t gotten much snow during our time in Hampton Roads. The boys pressed their faces to the windows and watched the flakes gently falling, turning the ground and trees white. We felt so cold and wore our heavy winter jackets and boots when we went out, but the boys loved it. Unfortunately the snow didn’t last as the temperatures went back up into the high 30s, but it was a slow melt. 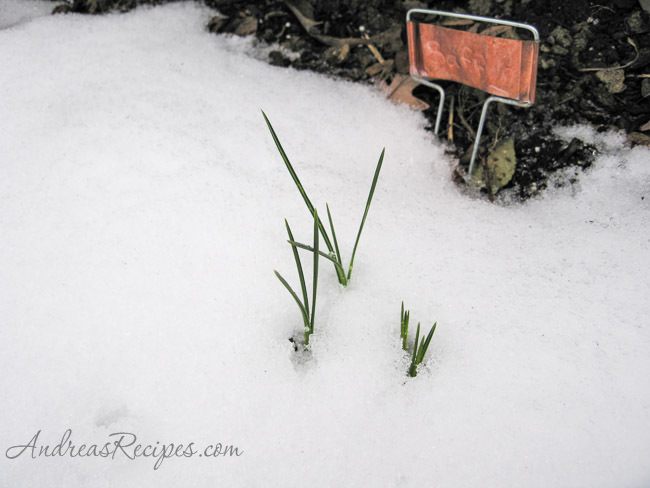 I went out to check on the saffron crocuses to see how they were holding up in the cold weather, and they look great. The slender green leaves were still peeking up through the snow. Congratulations on growing your own saffron. How long have you been harvesting your own saffron and this unusual in your neck of the woods or do you know of many other Northern Virginians who plant the crocus sativus corms? Curious becauase I’ve been following U.S. saffron production for a couple of decades as part of an ongoing interest in this product and its many interesting uses! Hi Ellen, thanks for stopping by. This is my first attempt at growing my own saffron, so it’s quite an experiment. I have two pots growing indoors and about 40 plants outdoors, and I hope to have some saffron threads to harvest in the fall!